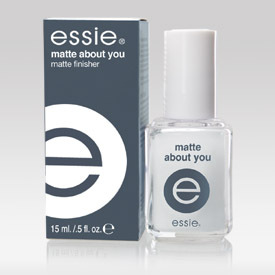 Essie Matte About YouI bought the Essie Matte About You a couple weeks ago but have been so busy with work that I haven't had a chance to try it. No joke, in anticipation of trying this finish out, I literally have been walking around with absolutely no nail polish on my toes and fingers for a week! Anyway, after a very, very long week of nakedness, I managed to squeeze in some time to paint them today. Yay for me. I have to say, Matte About You is AWESOME. Not only can I apply it over ANY color, but it dries super fast! Plus it's practically foolproof, it doesn't streak. Now it's like I'm rediscovering my nail polish collection all over again. I'm excited to see what my other colors will look like with this nifty matte finisher. Thanks Essie for saving me money on all the matte lacquers I would have bought in the future! !